I picked up Slavoj Zizek’s new book, Event, next to the cash register in the gift shop at the Tate Britain. Philosophy is an impulse buy at the Tate Britain. In this book Zizek takes seriously the theme of the Penguin book series “Philosophy in Transit” in which this is the second volume. His entry in the series is structured as a sequence of stops on a commuter rail line, as if a rapid reader could gobble up each chapter between stops. This may be possible for Zizek, the self-described “manic excessive,” but the rest of us shouldn’t despair at not finishing the book by the time we get to Central London. This book worked very well as a travel book for me, though, fitting into a side pocket of my jacket. Zizek dashes off the key concept of the book between sentences headed elsewhere: ” . . . an event is thus the effect that seems to exceed its causes – and the space of an event is that which opens up by the gap that separates an effect from its cause.” This is a very good place to start. Hume is nowhere mentioned in the book, nor is Sextus Empiricus, but this definition is worthy of the sceptical tradition of these two. Yes, the Event as gap is a very good place to start. This idea may even go further than the author thinks. I will present a couple of thoughts about two of these. First, on Buddhism: Zizek is famous for his debunking of Buddhism. In general he follows Nietzsche’s well-worn path in this. He combines the profane with the sacred: he hurtles along from the “Stamina Training Unit” (You will have to read it for yourself. I was howling . . .) to finally arrive at his Buddhism critique; or what he thinks is his Buddhism critique, for in “Buddhism” he initially lumps all sorts of New Age philosophies that have nothing to do with Reverend Gotama’s stories from the Pali Canon. Zizek addresses the First Discourse when he says that Buddhism is concerned with solving the problem of suffering, “ . . . so its first axiom is: we don’t want to suffer. (For a Freudian, this already is problematic and far from self-evident (sic) – not only on account of some obscure masochism, but on account of the deep satisfaction brought about by passionate attachment.” He accuses Buddhism of inconsistency: “But a problem arises here: if moderate good acts (the elementary morality with which Buddhist practice begins) help us to get rid of our excessive attachments, is it not the case that, when we reach Nirvana, we should be able to perform even brutal evil acts in such a way that leave no traces, because we perform them at a distance?” Well, no, actually this seems to be a non-sequitur, at least to this reader. There is no reason to think that an arhat who had achieved Nirvana would forget the First Discourse once he got there. But it also seems to me that Zizek has come closer to a puzzling truth of Reverend Gotama’s doctrine than he realizes. For isn’t the Event, as he defines it as the gap between cause and effect, the exact spot of Gotama’s Nirvana? If not Gotama’s Nirvana, then surely Dogen’s Nirvana! For isn’t this the place of being “un-conditioned?” Zizek’s Event is intended, it seems, in a Hegelian sense: it is a moment in time which changes the course of future events. Dogen’s Event is a stop in time, an eternal moment, but an Event all the same, by Zizek’s original definition. Another stop in Zizek’s commute throws off a hint into his answer to a question around which he often hovers, but doesn’t always state clearly: Why did the Communist project of the Twentieth Century fail? He says, “The Chinese Cultural Revolution serves as a lesson here: destroying old monuments proved not to be a true negation of the past. Rather it was an impotent passage a l’acte, an ‘acting out’ which bore witness to the failure to get rid of the past.” The reason the Communist regimes of the Twentieth Century failed to achieve communism is because they recapitulated structures of dominance from the previous bourgeois and even feudal periods of history. Not a bad explanation. Or was it because they never had a good idea of the goal to begin with? Zizek actually states pretty well what that goal should have been: “Imagine a society which fully integrated into its ethical substance the great modern axioms of freedom, equality, the duty of society to provide for education and basic healthcare of all it’s members, and which rendered racism or sexism simply unacceptable and ridiculous – there is no need even to argue against, say racism, since anyone who openly advocates racism is immediately perceived as a weird eccentric who cannot be taken seriously.” This flushes out Marx’s “from each according to their abilities and to each according to their needs” with some basic safeguards to human dignity. This seems like a pretty good place to end up. Garry Wills’s short book on Madison (James Madison) is not the complete story on our puzzling fourth President, but it captures well the many contradictory positions which Madison embraced during his long life. Wills’s book was a commissioned study in The American Presidents Series, so he concentrates on Madison’s tenure as President, which most historians (except perhaps Lynn Cheney) see as not anywhere near to the quality of the presidencies of Washington, Lincoln, or FDR. The most notable event in Madison’s presidency, of course, was the War of 1812, of which as Wills says, “After all, he deliberately went to war with incompetent war secretaries and generals, with inadequate economic and military resources, with reliance on an unfit militia. He accomplished not a single one of the five goals he set for the war to achieve.” But, unlike George W. Bush, who led the US into two even more disastrous wars, at the end of his term Madison was enormously popular, which led to the election of his hand-picked successor, Monroe. Wills highlights the contradictions in Madison’s thinking over his career, from being the “Father of the American Constitution” and the principal author with Hamilton of The Federalist Papers to the dogged adversary of Hamilton and the “Imperial Presidency.” He went from being the principal adviser to Washington on the details of his precedent-setting term in office to being totally scorned by the ”Father of his Country” over the Jay Treaty. Wills relies often on Henry Adams’s brilliant nineteenth century History of the United States during the Administrations of James Madison, on Madison’s complete writings, and on several more recent biographical studies. For those who aren’t satisfied with Wills’s short volume and want more of the details of Madison’s presidency, I would highly recommend Adams’s nearly 1,500 page study in the beautiful Library of America series. I won’t be reading Lynn Cheney’s alternative view of Madison. Wills is a trustworthy enough contemporary guide for me (highly trustworthy.) And I don’t want to spend time with the wife of someone as “duplicitous and dishonorable” as her husband. Character counts. Thomas Piketty is a relatively young economist who has spent most of his professional career teaching at the Paris School of Economics and the École des Hautes Études en Sciences Sociales after brief stints at MIT. He has collaborated with fellow École Normale Supérieure graduate Emmanuel Suez on comprehensive studies on income and wealth inequality. 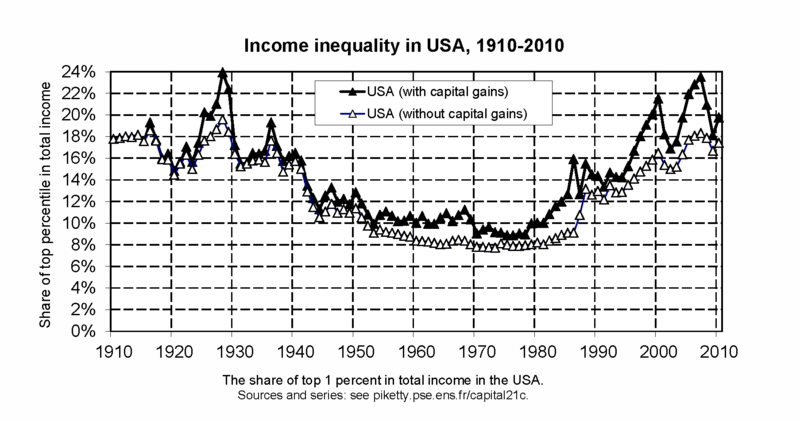 A chart of their data (similar to that shown above) is a frequently-used graphic (the one that looks like the Golden Gate Bridge) in Robert Reich’s current documentary film, Inequality for All. This figure shows the income of the top 1 percent of income earners as a ratio of the national income from the period from 1910 to 2010. It shows a dramatic peak just prior to the 1929 crash followed by a collapse in the years up to 1980 and then a dramatic rise back up to the same level of approximately 24 percent of national income that the one percent took home in the roaring twenties. In March 2014 the English translation of Piketty’s latest book, Capital in the Twenty-first Century, hit the streets in the US. It contains over 600 pages (including notes) of remarkable data and graphics depicting the historic evolution of income and wealth in our world. It has been making quite a splash in the United States, it’s English translation coming as it has on the heels of Inequality for All. It has been enthusiastically reviewed by prominent Nobel Prize winning economist and New York Times columnist Paul Krugman in a recent issue of the New York Review of Books and by another Nobel-winning neoclassical economist, Robert Solow, in the New Republic. Scores of other reviews have come out since it’s publication by Harvard Press in March from both right and left. Martin Feldstein, the chairman of Ronald Reagan’s Council on Economic Advisers, felt it necessary to attempt to debunk Piketty from the right in a Wall Street Journal column recently. Michael Roberts has been regularly working at debunking Piketty in the pages of his blog from a Marxist perspective. Someone who has raised such praise and ire from both left (Roberts), middle (Krugman and Solow), and right (Feldstein) must be on to something. Piketty’s book provides comprehensive documentation of the growing inequality that has the United States and Europe in its grip. But the forgotten element in this that Piketty brings to the discussion (if you have not read Ricardo and Marx) is that extreme inequality, in Europe at least, is not new. 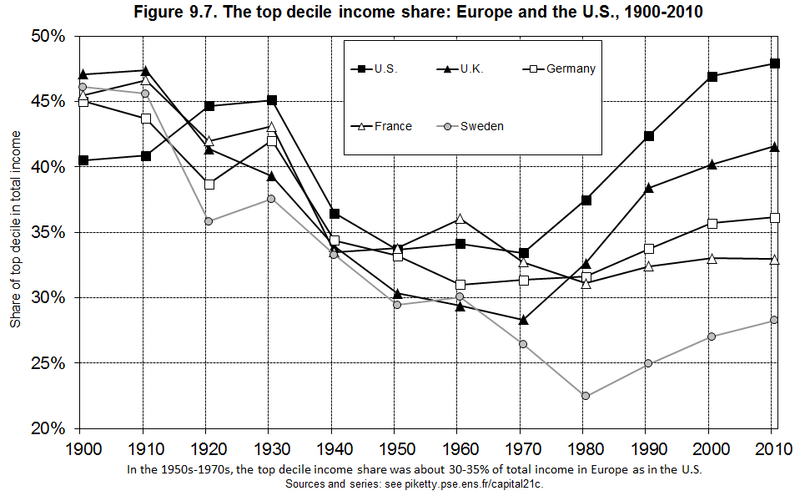 The inequality that has now established itself in both Europe and the United States is more like a return to the normal state of extreme concentration of wealth and income that ruled in the nineteenth century. It was only the great capital destruction of the inter-war years (and the threat posed by the success of socialist revolution in Russia – not so much emphasized by Piketty) that reduced inequality in the West in the twentieth century. Since then capital / GDP ratios have been steadily climbing back to the ratios that were common in the Gilded Age. Piketty calls this new reality “patrimonial capitalism” in that as economic growth chronically lags behind the rate of return that owners of capital can receive on their wealth, a tiny rentier class eventually emerges over generations that controls significant portions societal wealth and influence. This picture contradicts the story told by free market economists from Hayek to Kuznets to Milton Friedman and Paul Ryan that unregulated markets open doors to everyone to gain wealth. Instead, Piketty shows, the supposed triumph of capitalism in the wake of the fall of the Soviet empire, is more likely trending towards an entrenched structure of societal control by inherited wealth. Piketty’s title seems to be modeled after that of the famous book by Karl Marx, but Piketty is no revolutionary, rather a socialist of the contemporary French type which much more resembles the Democratic Party of FDR than any nineteenth century socialist party. Not that he thinks that this enormous inequality is a good thing, far from it, but his solution is rather a (modest) tax on capital than overthrow of the capitalist system. In other writings in the recent past Piketty has also recommended a return to the high top tax rates used in the United States and Europe in the period from the Great Depression prior to the Reagan / Thatcher putsch. Piketty says, “According to Kuznets’s theory, income inequality would automatically decrease in advanced phases of capitalist development, regardless of economic policy choices or other differences between countries, until eventually it stabilized at an acceptable level. Proposed in 1955, this was really a theory of the magical postwar years referred to in France as the “Trente Glorieuse,” the thirty glorious years from 1945 to 1975.” The “regardless of policy choices” part to this quote brings to mind the fact that Kuznets was an admirer of Joseph Schumpeter, whose reluctant conclusion was that socialism was an inevitable development from capitalist society. Kuznets thought that this eventual Elysian condition of “acceptable” inequality would come to both sides of the Iron Curtain. The remainder of Piketty’s book is a systematic demonstration that Kuznets was wrong and Ricardo and Marx had been right that “a small social group – landowners for Ricardo, industrial capitalists for Marx – would inevitably claim a steadily increasing share of output and income.” This had been true in the nineteenth century for Ricardo and Marx and Piketty predicts the trend that we have seen in the West since 1980 indicates that it will be true in the twenty first century. Kuznets was a pioneer to look at income share data, but he was looking at the wrong data set. He was looking at the period from 1913 to 1948, an anomalous period of revolution, war, and depression. When one “zooms out” to include the larger data set from 1700 to 2010, as does Piketty, the story looks more like the one that Ricardo and Marx had described and much less rosy that that depicted by Kuznets. Piketty presents simple models of the macroscopic economy, which he uses to illustrate theoretical concepts and manipulate his large database of income and wealth statistics. 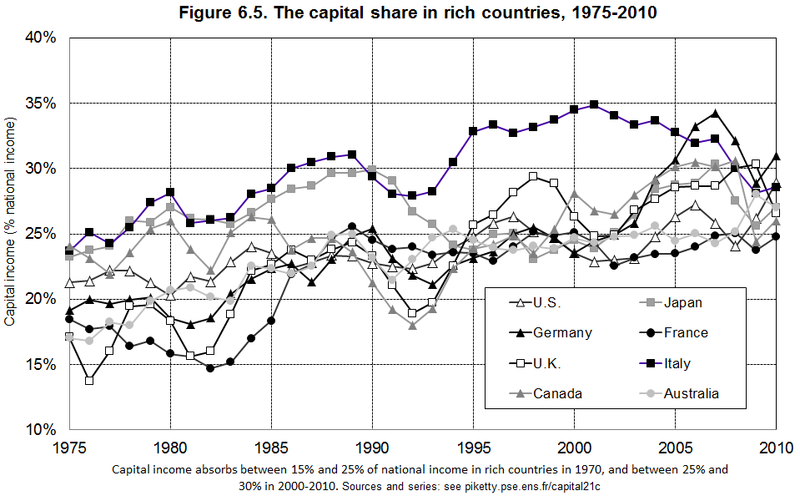 He uses these relationships as a guide to organizing his historical data, an example of which is shown above, representing the capital share in national income for a selection of rich countries during the the last quarter of the twentieth century. The graph illustrates a major theme of his book, the rising share of national income recovered by capital. Well, to this reviewer it seems not so much that he ignores Marx’s (and also Smith and Ricardo’s) law of value, but that Piketty is trying to expose the documented history of distribution in capitalism and DOES take it as a given that capitalists will have some part in our societies in the future. Piketty’s work is not aimed at Marxists, however, but rather at the conventional economists who, following Kuznets, have systematically ignored, explained away, or celebrated the tendency of capitalism to evolve towards extreme inequality. Roberts complains in his blog piece that Piketty doesn’t seem to have read much Marx at all, although there are references to Marx throughout the text and Piketty indicates familiarity with Volume I of Capital in, for example, Chapter 6 (page 229). “To be sure, the law β = s / g describes a growth path in which all macroeconomic quantities – capital stock, income and output flows – progress at the same pace over the long run. Still . . . . such balanced growth does not guarantee a harmonious distribution of wealth and in no way implies the disappearance or even reduction in inequality in the ownership of capital. Furthermore . . . . the law β = s / g in no way precludes vary large variations in the capital / income ratio over time and between countries. Quite the contrary, in my view, the virulence – and at times sterility – of the Cambridge capital controversy was due in part to the fact that the participants on both sides lacked the historical data needed to clarify the terms of the debate.” (page 232). Indeed, to provide an estimate of this historical data seems to have been the primary motivation for Piketty’s research. The third part of Piketty’s book presents his detailed development of the evolution of inequality in income and wealth in the world economy over the long term. The figure above is the one figure from Piketty’s book that apparently especially caught Paul Krugman’s eye, since it is the only figure accompanying Krugman’s New York Review summary. This figure provides the data for the key driver that Piketty sees as pushing our world into an increasingly unequal one. His mathematical expression for this is “r > g”. 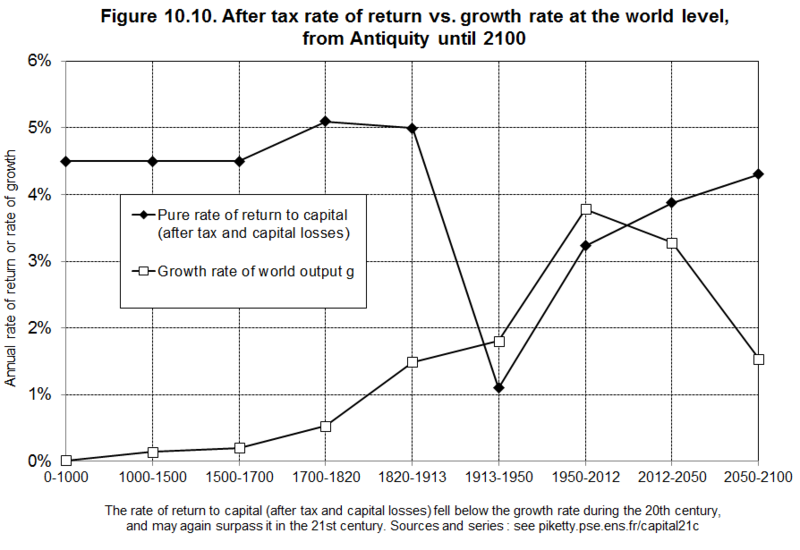 As long as the return on capital is greater than the growth rate of the economy, the owners of large quantities of capital will accrue rewards in excess of that required for their immediate needs and will continue to grow their wealth, relative to national income and relative to the mass of workers in the economy who have little savings or investment capital. Roberts’s quarrel that Piketty provides no causative law for what exactly determines this “r” is true, as far as it goes. Piketty’s answer to this quarrel, I think, however, would be that it is really not important what causes “r”. He finds that, for whatever reason, it seems to be relatively stable over a very long time. We recall the money changers in the temple in the time of the New Testament and Shylock from The Merchant of Venice. The Marxist historian E.J. Hobsbawm reports in The Age of Revolution that “The French Assignats (1789) were at first simply French Treasury bonds (bons de tresor) with 5 percent interest, designated to anticipate the proceeds of the eventual sale of church lands.” This 5 percent rate happens to be very close to the one that Piketty assigns to the admittedly indefinite past and future in his Figure 10.10. Joan Robinson complained bitterly (in Economic Philosophy and elsewhere) about Marshall’s explanation for the rate of interest as the “reward for waiting.” This seems to be on the same footing as the more sophisticated-sounding explanation of the “neo-neo-classicals” that it is the reward for the “marginal productivity of capital.” To a Marxist this is bunk, since capital is only stored labor. But whether this is a “reward for waiting” or surplus gleaned from prior labor or simply a reward for having money, the point is that this reward has a long history, dating back at least as far as the money changers in the New Testament. Piketty is concerned not so much with how this rate is justified, but how it works in conjunction with other factors in the economy (namely “g”) to drive inequality. Feldstein, in his notice of Piketty’s book in the Wall Street Journal wonders what’s all this fuss about inequality, “The problem with the distribution of income in this country is not that some people earn high incomes because of skill, training or luck. The problem is the persistence of poverty. To reduce that persistent poverty we need stronger economic growth and a different approach to education and training, not the confiscatory taxes on income and wealth that Mr. Piketty recommends.” I have written about this before. The data that I showed there (and which are consistent with the data in Piketty’s new book) convince me that this Republican shibboleth (that lower tax rates produce more growth and jobs for all) is a colossal sham. If for no other reason, Piketty’s book will be important in the future for its demonstrating the vacuity of these Reagan-era claims that a rising tide will lift all boats and that capitalism is not a rigged game. Productivity in the US economy has been rising alright in the last forty years, but it is only the fortunes of the owners of the yachts in the harbors at Monaco and Cannes that have been rising. The incomes of the majority in the US have been stagnant throughout this post-Reagan era. It is no longer credible to say that this has nothing to do with the nature of the capitalist system or even with rates of taxation. Can one really believe that the pay of corporate executives (the “supermanagers” in Piketty’s parlance) would be rising as fast as Piketty has demonstrated that they have been with a taxation rate at the top level of 77 percent as it was in 1977, compared to the 39% that we have today (after going as low as 28% during Mr. Feldstein’s tour of duty in the Reagan administration)? His Figure 14.1 is identical to the top tax rate curve that I showed in my prior post, concave in the middle of the twentieth century, the opposite of growth rates and average income. 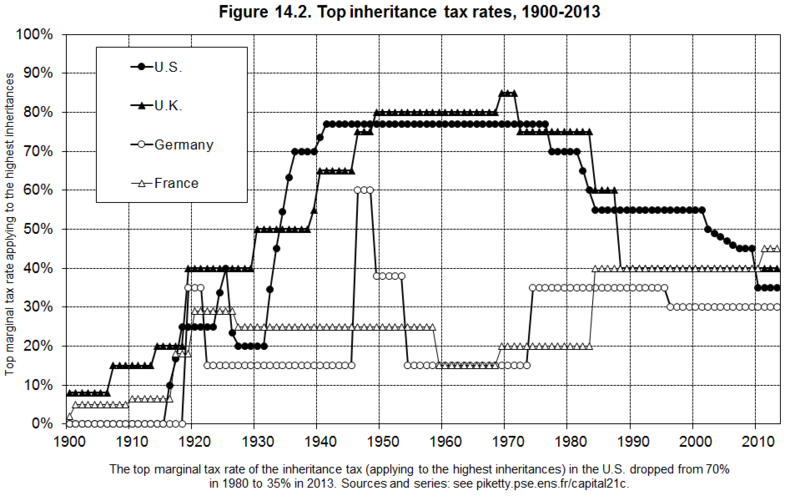 His Figure 14.2 (above) likewise shows that the concave curve for inheritance taxes is the exact opposite of the convex one for the top wealth share. It’s the top tax rate, stupid! But isn’t inequality required to provide incentives for effort in our merit-based economy? What is the problem with inequality? Don’t we need it? Isn’t this what made America “great”? There is a constant drone to this effect in the speeches of Republican congressmen (and women, unfortunately) in the US House of Representatives today. These questions and statements are a mixture of propositions that could conceivably be based in fact and those which are wholly “theoretical” in the worst (metaphysical) sense of the word. One could say that a doctor would be working the same way if he were compensated the same as a ditch digger assuming both received free public education for their skills and were provided with ample compensation to allow them both to enjoy the fruits of the productivity gains of the twenty-first century. Michael Roberts implies as much in a recent blog post. And one could also say that inequality, even the grotesque inequality that Piketty (and Ricardo and Marx before him) shows is the inevitable result of capitalism, is perfectly justified on moral grounds (on what moral grounds I couldn’t say, but don’t doubt that many would tell you this.) What is NOT possible to say, as Kuznets and many apologists for capitalism have said, is that capitalism and equality are partners and that capitalism does not lead to a society of a very small number of fabulously wealthy individuals buoyed up upon a sea of souls living in near or dire poverty. Not after the work that Piketty has done. And it is also very clear that one cannot take refuge in the Declaration of Independence or any other document of the Enlightenment in justifying the extreme inequality that Piketty has revealed. Those words “All men are created equal . . .” cannot be written out of that document at this point. If one embraces inequality, one is really embracing the world that the American Revolutionaries fought against. It turns out that that fight is still very much on. When a discussion group decided to take up the subject of Georg Wilhelm Friedrich Hegel, my friend Charlton asked the question “Why Hegel?” No one tried to respond directly to Charlton at the time, but now, having gone through the discussion, which centered on the short book, Hegel, by Singer, I have endeavored to answer this question. First let’s try to understand where the question is coming from. I haven’t asked Charlton, but I think it is fair to say that the general impression of Hegel among reasonably well-educated people in the United States today is that he was ‘one of those idealist German philosophers from the nineteenth century’ who was very popular then, but who couldn’t hold much interest for us in the twenty-first century. We are all materialists now. Besides, his writing was ponderous. Even Karl Marx rejected him! It goes on like this for 69 pages. Marx’s critique was more serious and has had more influence. Unlike Russell and Popper, Marx had a relatively deep understanding and appreciation of Hegel. There are two extended critiques of Hegel translated into English in the volume Early Writings by Marx, a partially complete Critique of Hegel’s Doctrine of the State of 1843 and a chapter in the Economic and Philosophical Manuscripts of 1844 entitled, “Critique of Hegel’s Dialectic and General Philosophy.” The former is a critique of Hegel’s last published work, Philosophy of Right. Hegel’s preface to this work is dated 1820. Marx evaluates only the third section of the third part of this work, on the state. In his critique of this work, Marx’s chief complaint seems to this reader to be that Hegel gets the cart before the horse when he declares the identity of state and civil society; that he gives preference to the state and neglects the (evil) influence of civil society. I think this criticism is unfair. At the time Hegel was writing, Germany was still very much evolving out of feudalism. Hegel was in no way as aware in 1820 of the developments in England that we now call the “Industrial Revolution” that brought capitalism into being as Marx could be in the 1840s. 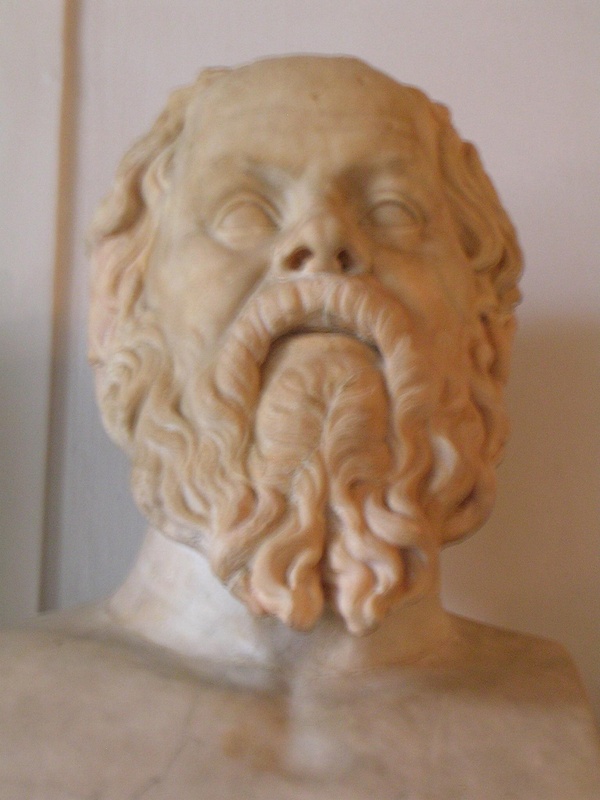 By the time Marx was writing his Economic and Philosophical Manuscripts he was already steeped in the writings of the Scottish (Smith), English (Ricardo and Mill), and French (Say) economists and had devoured the latest empirical data on the state of the economy in England and, to a lesser extent, France. His moral outrage at the misery that capitalism inflicted on the working classes is palpable in his work from 1844 onwards. But this was a different world from Hegel’s world. In his outrage that Hegel couldn’t see the importance of capitalism in the tug of war between the state and civil society, Marx was being ungenerous, at least. It seems to me that both Hegel and Marx were right about this. Hegel was right as the first philosopher to incorporate the both/and of these two entities and to relate this linkage to a theory of consciousness that he had already developed in the Phenomenology. Marx was right to see the cruelty of the new civil society that grew out of the industrial revolution and to see that this evil infected the state. Many modern (especially continental European) commentators, however, think that this view is naïve; that Hegel represents a watershed figure in Western philosophy who has not been overtaken since. What is their argument? There is much more to say about Marabou’s book and much to say about other authors who have written persuasively on Hegel in the twnetieth century: Kojeve, Graham Priest, Gadamer, Jameson, and Zizek. And much to say about Hegel’s books, of course, especially the Phenomenology and the Logics. But this post has been too long delayed. I will try to say more about these in future. The April issue of Monthly Review contains an article by the contemporary German Marxist scholar Michael Heinrich titled “Failure of the Falling Rate of Profit Theory – Marx’s Studies in the 1970’s.” Marx had maintained in Volume Three of Capital that there was a tendency for the general rate of profit to fall in capitalist economies, which tendency he maintained was part of the inherent logic of capitalism. This was not a view unique to Marx, of course. Adam Smith, for example, in Book I, Chapter 9 of The Wealth of Nations maintains that the rate of profit tends to fall over time due to completive forces. John Stuart Mill also argued that there was a tendency for the rate of profit to fall over time. But Marx made this an important part of his critique of capitalism in Volume Three of Capital. Heinrich, in his article and in chapter 7 of his recently translated book, An Introduction to the Three Volumes of Karl Marx’s Capital, also published by Monthly Review Press, maintains that this “law” applies only under certain specific conditions. To understand his argument, it is helpful to develop the simple math of Marx’s argument. 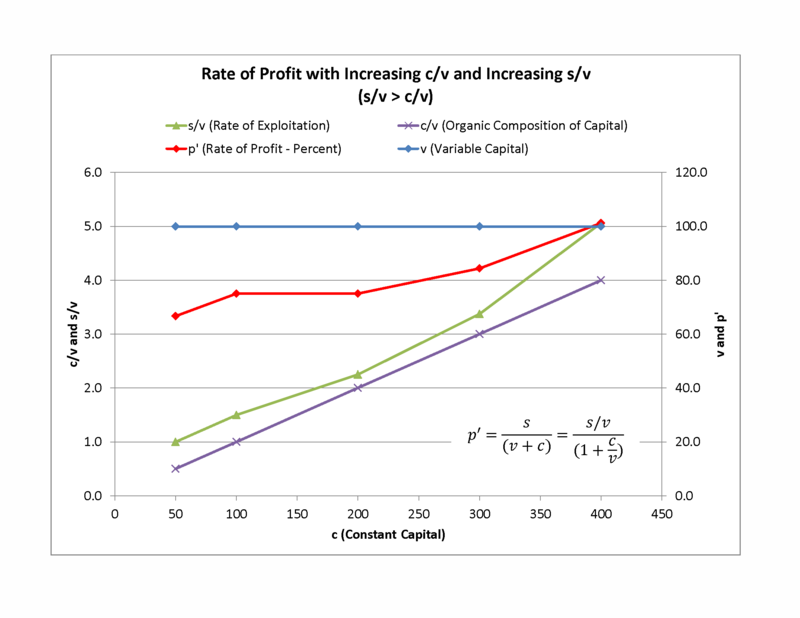 What this equation clearly shows is that as relative investment (c/v in the denominator) increases, the rate of profit tends to fall, assuming a constant rate of exploitation (s/v in the numerator). 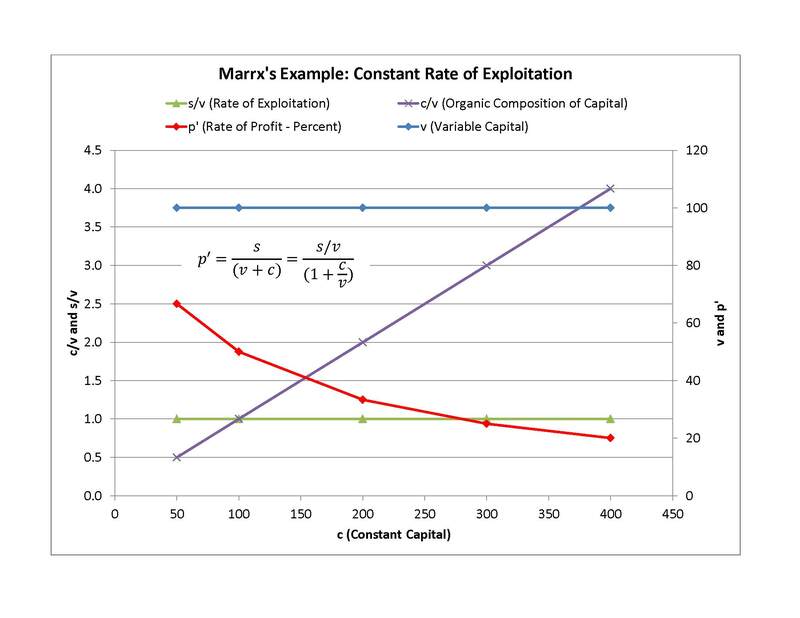 In Chapter XIII of Volume III of Capital Marx presents his argument for “The Law of the Tendency of the Rate of Profit to Fall.” Marx starts with the example of a constant rate of exploitation. In his example the value of constant capital is varied from 50 to 400 currency units while in each case v is equal to 100 and the rate of surplus-value is 100%, or 100 currency units. He calculates the rate of profit in each case (s/C) and finds that the rate goes from 66.67 percent in the first case to 20 percent in the last case as investment is increased from 50 to 400 units. I think it is useful to see this graphically in the following figure. 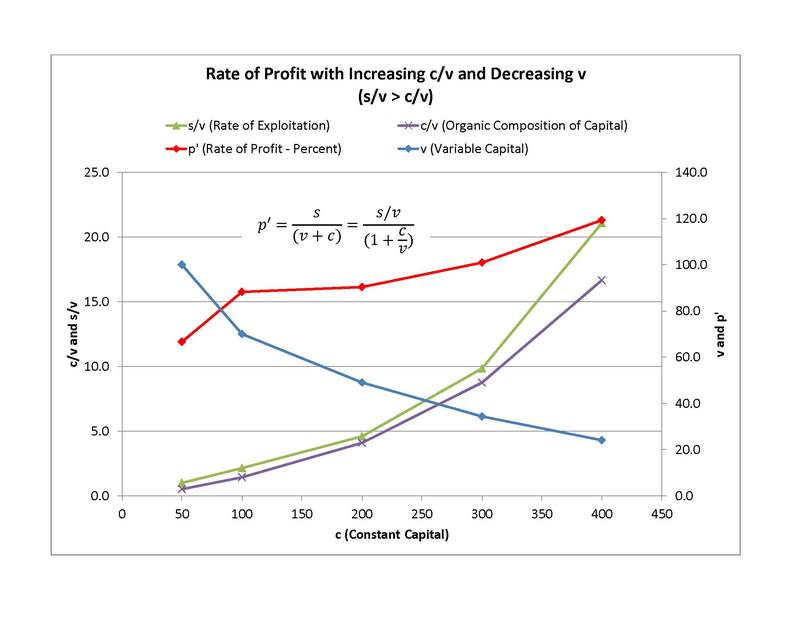 In this case of the “same degree of labour exploitation” the result is a falling rate of profit as relative investment, c/v, is increased.The figure illustrates this case. s/v is constant, meaning that the application of capital has not made an hour of labor more productive. This is surely not a very common situation. Why would a capitalist invest if he didn’t think that it would make labor more productive? This case results in a falling rate of profit: as the constant capital increases from 50 to 400 units, the rate of profit falls from 70% to 20%. 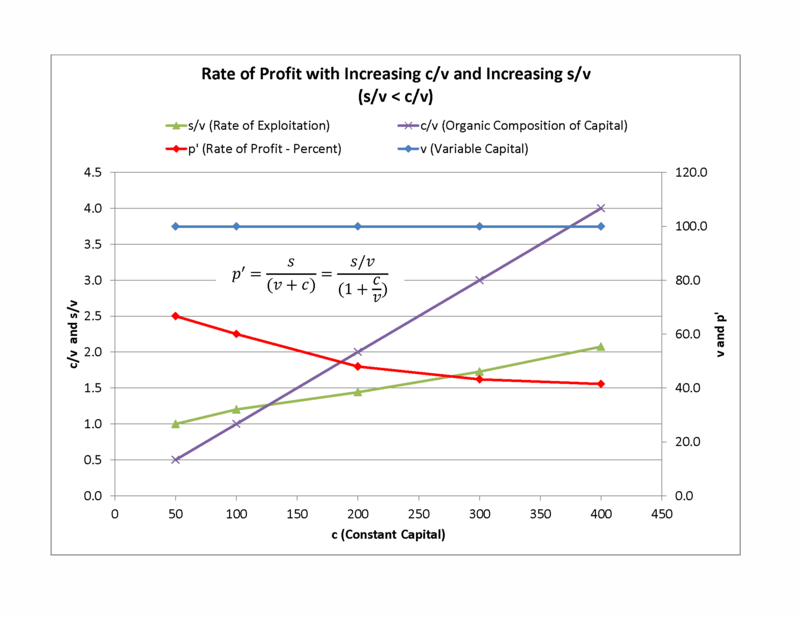 Graphs similar to the case of constant exploitation are illustrated below for each of these cases. In this case I have assumed that the rate of exploitation would decrease as investment is increased. This is not a very realistic case, either, since it would imply that the surplus per worker decreases as more investment is supplied. Not surprisingly, the rate of profit falls in this case as well and to a lower level than in the case of constant surplus exploitation. This is a more realistic case. Here, as investment is applied to the enterprise, the rate of extraction of surplus from an individual worker increases. For otherwise, why would the capitalist invest? In this case the rate of profit still falls, however, from an initial value of 70 percent, but in this case to only 40 percent. This case is set up so that the rate of growth of s/v (the slope of the line) is just greater than the growth rate of c/v. Unlike the previous cases, this case yields an increasing rate of profit. Is this a possible case? It certainly seems to me in cases where the rate of surplus extraction is greater than the relative value of capital invested that profits would rise. In any case, it seems to illustrate the incentive that capitalists have to increase s/v, by increasing the amount of surplus achieved (by monopoly, for example). This case assumes a constant variable capital. This next case illustrates the case where the variable capital following investment is driven down, either by decreasing the number of workers or by decreasing their pay, or both. In this case s/v, the rate of exploitation is constant. This turns out to be another case where the rate of profit falls, from 70% to under 20% as constant capital is increased from 50 to 400. 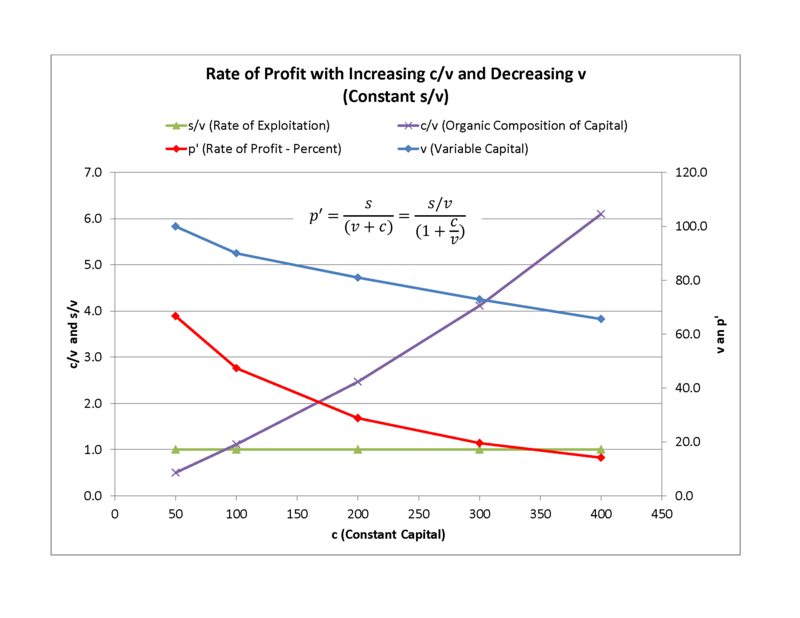 In this last case we assume that the rate of expenditure on wages and supplies (variable capital, v) decreases, the situation that one would think the capitalist investing in an enterprise would expect, but unlike the previous case with falling v, in this case the rate growth of the rate of exploitation, s/v, is greater than the rate of increase in relative constant capital, c/v. In this case, the rate of surplus starts at 100% of wages (v) but increases to 150% as investment is applied. 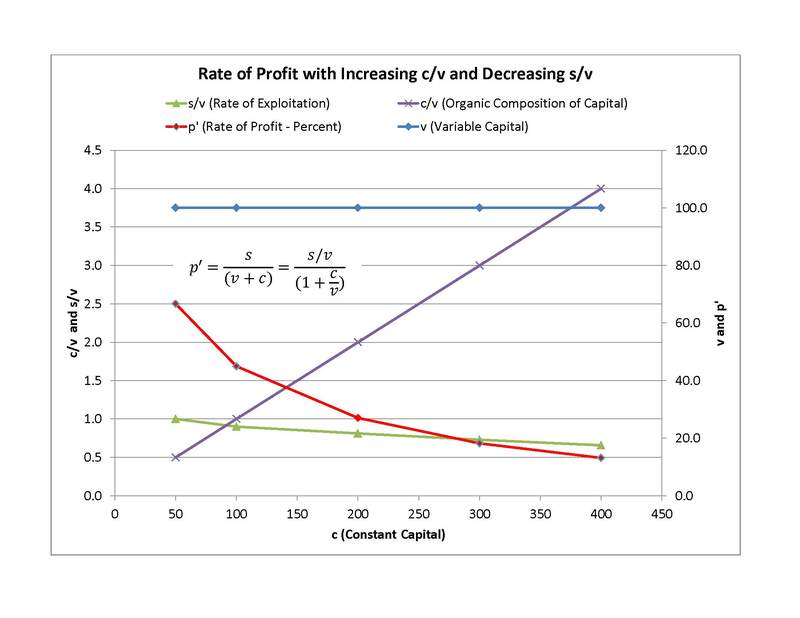 Here we see that the rate of profit soars from the initial rate of 70% to 120%. So what does this seem to show? To me it seems to show that, even in Marx’s world of pure competition, it is very possible for profit rates to increase, but for this to happen the rate of exploitation needs to increase more dramatically as more investment is applied. In our age of globalization and union busting, isn’t that what we see happening?